Wallace Chevrolet > Winter Driving > Do I Need Winter Tires in Toronto? Do I need winter tires? What’s the big difference between summer tires and winter tires anyway? Why do I even NEED winter tires when all tires are made of the same material? There’s a great reason why summer tires work so well in warm weather…they were designed for it! Summer tires vary depending on their intended application (comfort, performance, fuel economy, etc), but all of them are designed to provide maximum stick on dry surfaces. Specially designed treads grip the ground and keep comfort, noise and vibration levels in check. The shape of the channels and tread of a summer tire does not lend itself well to slush or ice! Look at your car tire and you’ll SEE the problem! Snow, ice and slush get stuck in the grooves and clog the channels which creates a slippery surface with little grip. Traction gets doubtful below 7 degrees celcius, the compound gets hard, and in freezing cold temperatures your summer tires are about as useful as skis. Find The Right Tires For Your Car Here! Purpose built for winter like a snow-shoe, winter tires use a softer compound that’s designed to optimize grip and make it easy to carve through snow. Wider channels & grooves whisk away wetness! Unlike the hard compound of a summer tire, which sticks to tarmac like glue, the softer composition allows the tire to retain its pliability even in sub-zero temperatures. It also features a more aggressive tread pattern designed to siphon water away. 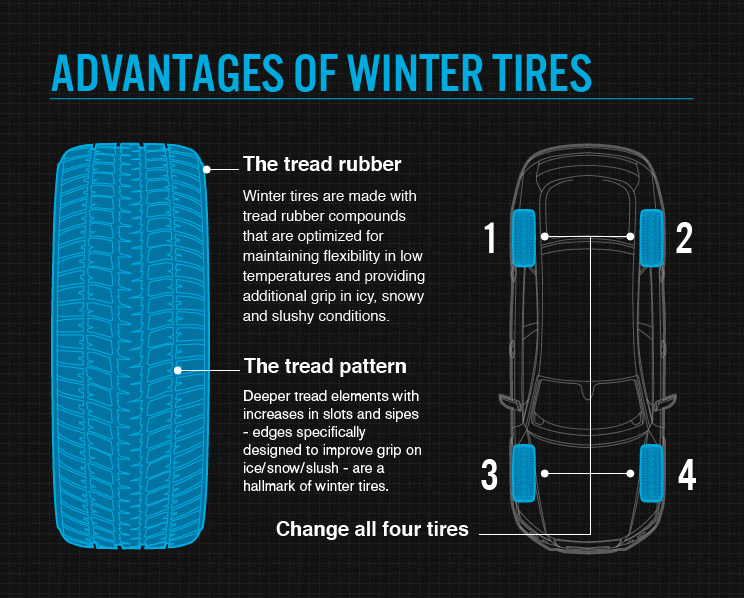 Like many specialized tools, winter tires are best used for their designated purpose…snow & ice! 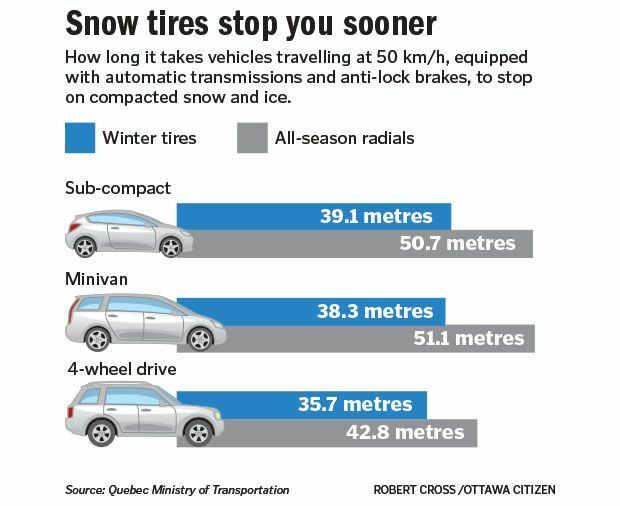 While your vehicle is perfectly capable of driving on snow tires in summer, the lack of ice & snow will significantly increase wear on your tires! Plus, your vehicle will likely ride more harshly on winter tires due to the fatter treads and tire perforations. Be sure to swap back to summer tires when possible!